Many activities that are good for us are also good for the environment! That’s why Healthy IU and Sustain IU are partnering for the 3-week “Sustain and Move IU!” Challenge. Walking, bicycling, and using public transportation or carpooling help us stay active and lower our carbon footprint. Sustain & Move IU! is a challenge that can be taken anywhere — at home, work, or play. Each week, participants will select 2 activities to try, such as taking a nature walk, carpooling to lunch, or bicycling with family. (Click here to view all the weekly options.) 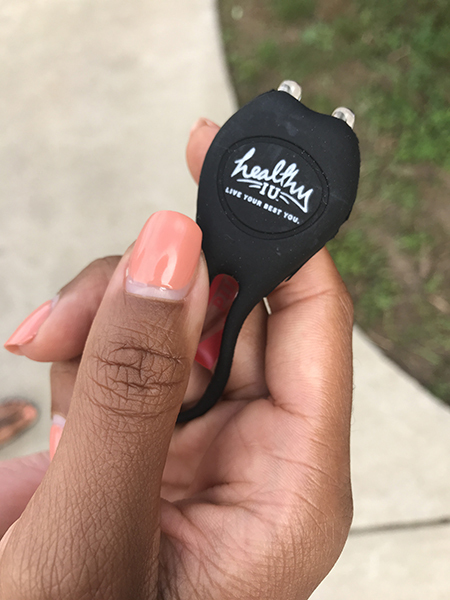 Full-time IU faculty & staff, and their spouses on an IU-sponsored medical plan, are eligible to receive the challenge incentive, a clip-on light that can be used while walking or bicycling (while supplies last). Join us as we explore how walking, bicycling, carpooling, and taking mass transit can improve our health and the environment, too! At the start of each week, participants will learn about sustainable physical activity ideas, and then choose 2 options they would like to try. Check out a list here. At the end of each week, participants will track their success and reflections in a Personal Online Tracker. The focus of the challenge is on taking small steps, which is a key factor in making lasting (and yes, sustainable!) change. Healthy IU and Sustain IU will provide support and helpful tips about active transportation throughout the challenge. Through "Sustain & Move IU!," participants will reduce carbon emissions, try new modes of transportation, get more active, and have FUN participating alongside their co-workers, spouses, and community members. Look for an e-mail from Healthy IU on October 8, 2018, the first day of the challenge. The e-mail will have a link to your Personal Online Tracker. During the challenge, October 8-26, log your experiences with active transportation in your Personal Online Tracker. If you'd like a tracker you can print out and keep handy, you can download it here. If you choose to print, please recycle. And be sure to update your online tracker, too! Full-time faculty/staff and their spouses are eligible for a participation incentive, while supplies last. The incentive for Sustain & Move IU! is a clip-on, flashing safety light — which we hope you will be able to use during the challenge activities. These lights can be clipped on to your clothing, bicycle, or backpack for safety while walking or bicycling in darker conditions. Safety lights are available to eligible participants on a first-come, first-serve basis, while supplies last. Did you know? There are 8 Dimensions of Wellness! We hope that through this challenge, you begin to feel the connection between all aspects of your wellness. Sustainability efforts can definitely be focused on the environment, and they can be focused on our own health and wellness, too! Seeking and maintaining a good balance in all 8 Dimensions of Wellness is a sustainable path toward well-being. Looking for more information to help with a sustainable lifestyle? Check out local resources below! Healthy IU has partnered with Sustain IU to showcase the role sustainability plays in health and well-being. IU’s commitment to sustainability is rooted in the notion that every Hoosier plays a role in creating a thriving legacy for the future. With a mission to catalyze a thriving culture of sustainability in academic, research, operations, administration, campus life and community outreach to enhance environmental health, economic prosperity, and social equity—Sustain IU seeks to empower staff, faculty and students to ensure a lasting positive impact. Learn more about what’s happening on your campus and how you can support sustainable efforts. Check out the FAQ page, or submit your question to challeng@iu.edu.